Team Israel’s Cody Decker continues his playful ways – even in American professional baseball. Cody Decker was arguably the heart, soul and class clown of Israel’s baseball team, which took the world by surprise in the 2017 World Baseball Classic. Decker and his teammates won the qualifiers in Brooklyn and they beat three opposing teams (South Korea, Chinese Taipei and the Netherlands) in the first round in Korea. Team Israel then lost two of three games in Round 2, played in Japan. Decker and nine teammates visited Israel last year before the tournament. “I think that having Cody and Jenn [his wife] on the trip to Israel made ‘the cause’ that much more real for him. For the first time, he really understood what he was playing for and the speech he gave at the Beit Shemesh field dedication exemplified that commitment,” adds Kurz. 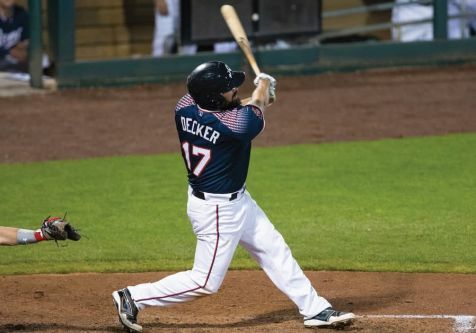 Decker currently plays infield for the Reno Aces (the AAA affiliate of the Arizona Diamondbacks) in the Pacific Coast League, where he is batting a solid.261 with eight home runs and 24 RBIs. The love and admiration felt for Decker during the World Baseball Classic continues in Reno. The Magazine caught up with Decker in the dugout after the Reno Aces defeated the Sacramento River Cats (the AAA affiliate of the San Francisco Giants) 8 to 2. Decker struck out in the bottom of the sixth, his only plate appearance, when he appeared as a pinch hitter. 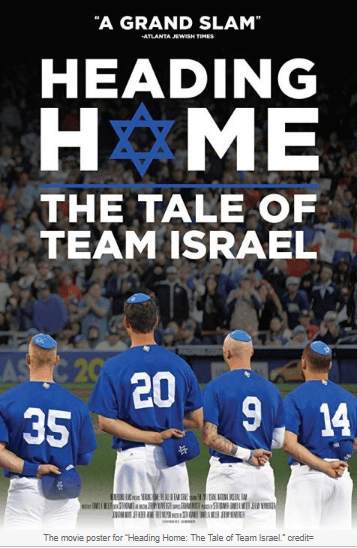 Have you seen the 2018 documentary film Heading Home: The Tale of Team Israel yet? Yes, about four times now. Jenn did a Q and A for a group; I’ve done some Q and As and will be doing another in Orange County (California) in the off season, so that will be fun. My impression is that the film is good. I am very glad they made it; they need to work on marketing. It is far less a Jewish story than a baseball story. It is about putting together a ragtag bunch of players who had been overlooked their entire careers. We had a chance to go out in front of the world and show that we were better than they thought. That was the story, but it was more that – we happened to all be Jewish. I kind of love that this is how it was all put together. I think that is the right story to tell; there are plenty of Jewish elements. It is as much that as it is the other story. You and Jenn both got to go to Israel? You recently got married? We went to Israel – Tel Aviv, then Jerusalem and stopped in Beit Shemesh. At no point did I think that I would enjoy Jerusalem more than I enjoyed Tel Aviv – this big, beautiful thriving city. I was expecting Jerusalem to be old and very historic but not as grand as it was. 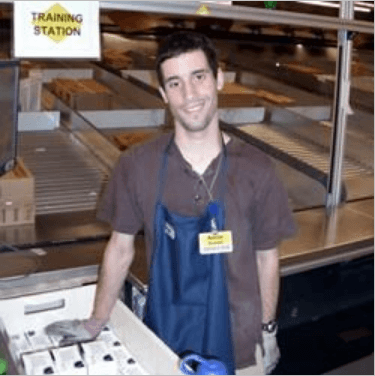 WOW – was I way wrong! I loved every second in Jerusalem. It was beautiful, amazing watching all faiths throughout. That was really cool when the Muslims were praying. My wife (we got married six months ago) is Christian, so seeing a lot of the old churches and going with the tour guide and learning. This right here is where Jesus was. The whole trip was very fascinating. It was fantastic and we loved every second of it. When you think about what it has done for your relationship with Judaism, and Israel – what is it like looking back? I can’t wait to go back! I wouldn’t say it necessarily made me more religious or spiritual or anything but it makes you appreciate… I have always appreciated my heritage. Going over there and seeing the Western Wall – it was probably the most striking thing to me. We went on a Friday night. There were so many people praying and dancing. 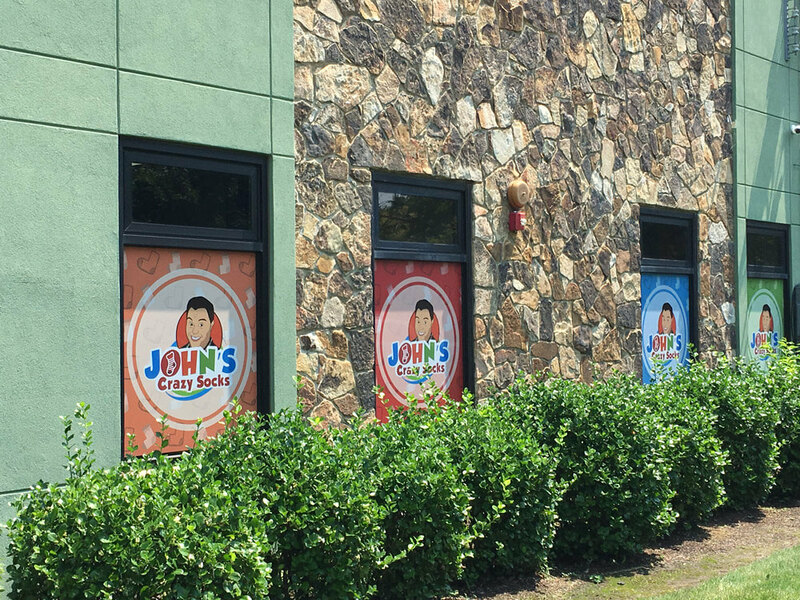 It was crazy – it was great – I loved every second! Do you think Team Israel will be part of your future down the road? Peter [Kurz], the team president, is hoping that I am coming back to Team Israel! Do your teammates on the Aces know about this Team Israel and Jewish part of you? There just happens to not be a lot of Jewish baseball players. I don’t think there is any particular reason for it, other than that there just aren’t that many of us. I grew up in Santa Monica [California], a huge Jewish community, and I played with a lot of Jewish kids. I’m not going to lie to you. Most of them were terrible! It is not because they were Jewish. They just weren’t very good at baseball. Then when I got older and started traveling the country, and occasionally the world, you find out there just aren’t a whole lot of Jews playing baseball. You go around the country, in Texas and certain spots in Florida, there just aren’t that many Jews around. It’s not like Santa Monica, where it is just normal. A large Mexican community, a large Jewish community, a large African American community, and for whatever reason, I was just unique, I was just brought up with that. Has your role as team prankster continued with the Aces? No, I’m leaving guys alone. People are watching me too closely. They know I’ll do it! I’d love to but… I’ll even say something and they’ll give me the side eye. They’ll think I’m lying or trying to set them up. I’m not. I’m actually enjoying that more than anything, that people are very suspicious of me at all times. It keeps them alert, I think. Do they know about the Mensch on the Bench? Are they aware of that? They are. The Mensch on the Bench was over in Jackson. He is back home in Santa Monica. We shipped him in a huge box. He is in my parents’ office and it’s just a gigantic box that happens to have a Mensch in it. I was thinking of selling it. I think it is time to sell it. Or auction it off for a charity. I don’t know how to do it. But your teammates here don’t know about the Mensch on the Bench? Yeah, they do. It was in my locker in spring training. It had its own locker in spring training. I had my locker, which said “Cober Commander” on it, and the next locker next to me was the Mensch. The Mensch was there. I pitched because we were out of pitchers. I don’t think I am too worried about my arm going to pieces, pitching 52 miles per hour! I am just going up there to throw strikes and let them get themselves out. Injuries? I’m good. This is my seventh season in the PCL [Pacific Coast League], my fifth or sixth PCL team…Tucson, El Paso, Albuquerque, Omaha, Vegas… seventh! I’ve always had a lot of success playing here as an opposing player. Coming here I got off to a really hot start. Important guys in the Diamondbacks organization got activated so my playing time took a pretty hefty dip. I had to work on being off the bench, which is not the easiest of jobs. I had a DL [disabled list] stint during that time. I’m having a pretty good year all things considered. I know what I can do on the field. I’ve always felt I belonged in the big leagues; that’s why I’m doing this. But I will say the Aces have been fantastic. The front office has been good. The stadium is always beautiful. Our locker room is great. Our jerseys have gotten better. We had a jersey issue… we had two jerseys that weighed roughly 35 pounds [15.8 kg.}. Luckily, we fixed one of them. The other one still weighs a solid ton and a half. The Diamondbacks organization has been nothing but the most classy, honest and well-put-together organization. I really appreciate being a part of this organization. Hopefully I will get out there more consistently eventually and get a shot at the big leagues. Any plans for All-Star break [which started the day after the interview]? I’m actually flying to Las Vegas to meet up with my wife, which I am very excited about. Four nights with my wife will be very nice. Take her out to dinner, maybe go to a show or something. I look forward to seeing her. Is that where you are living? No, we are based in Los Angeles, but she is going there for work stuff. I’m flying there. She is driving there as we speak. I’m going to meet her there. Has the Jewish community in Reno reached out to you? Is there one here? I’m not gonna lie to you, I don’t know of one. So I have been reached out to by no one. Normally when I go play in a place, I’ll be stretching before a game, and I’ll have like five people yelling “Cody, Cody, I’m Jewish.” I don’t know, I don’t know of a Jewish community here. But in fairness, I haven’t been out trying to find it. Do you think that Team Israel is something that can be in your future? That’s a couple of years down the road. I guess we’ll address it when it comes up. The qualifier was a really great experience. Loved every second of the qualifiers. It was a special group of guys. Are you still in touch with those guys? I was already in touch with them to begin with. Nate Freiman and I had played together for years. Nate is one of my dearest friends. He was at my wedding. And I have known Zach Bornstein for a long time. Ryan Lavarnway is a good friend. There are not many of us. We kind of all have friendships. Blake Gailen, we would hit together every off season. He is still one of my good friends. He was almost in my wedding. He was on standby in case somebody went down. It is a good group of guys, every one of them. I miss them and look forward to seeing them all again. I’m sure I’ll some them again, somewhere down the road. All in all, it is a good deal. Mental coach Justine Siegal and IAB exec Margo Sugarman help blue-and-white contend in the World Baseball Classic. 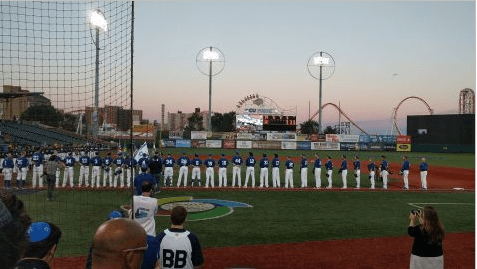 BROOKLYN – When Team Israel lines up along first-base side at the start of each World Baseball Classic Qualifier game, fans tend to notice the long hair of the player with the No. 15 jersey. While pitcher Shlomo Lipetz (No. 12) has long black hair, it is the long blonde hair which gets the most attention. On closer inspection, No. 15 is actually a woman! 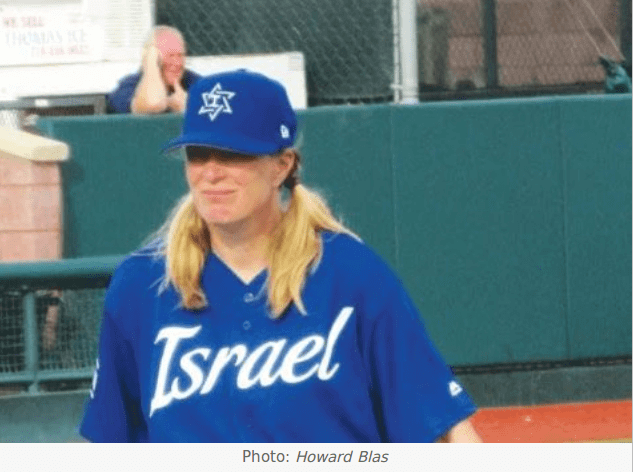 Coach Justine Siegal is one of two women helping lead Team Israel to victory in the WBC Qualifier tournament in Brooklyn which saw Israel play Great Britain in Sunday night’s final for a spot in the main draw of the World Baseball Classic next year in South Korea. Siegal, invited by Manager Jerry Weinstein to serve as mental coach for Team Israel, has a very impressive sports resume as a player, coach, academic and champion for female participation in baseball. Siegal has a PhD in sports psychology, and she is the founder of Baseball for All,an organization which provides opportunities for girls to participate in baseball In 2009, Siegal also became the first woman to be hired as a coach at any professional level when she served as firstbase coach for the independent baseball team, the Brockton Rox. Siegal is the first woman to throw batting practice for a Major League Baseball team, a feat she accomplished first in 2015 with the Oakland Athletics, and with several teams since including the Tampa Bay Rays, St.
Louis Cardinals, Houston Astros, and New York Mets. The road to baseball coaching was not always smooth. Siegal grew up in the suburbs of Cleveland playing baseball, attending Cleveland Indians baseball games with her season ticket-holding grandfather and discussing baseball around the dinner table. Siegal loved the sport and imagined she’d be involved in baseball forever. At age 13, around the time she celebrated her bat mitzva in Israel, Siegal encountered her first obstacle. A coach told her she couldn’t play baseball, as girls play softball. Manager Jerry Weinstein took notice and invited her to help Team Israel. 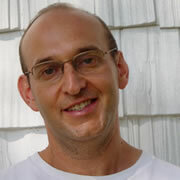 Siegal is among the members of Team Israel who strongly identifies as a Jew, and who has visited the Holy Land. Siegal is proud of her accomplishments in baseball but acknowledges that her goals is to not be the only woman in baseball. Margo Sugarman is another important female member of Team Israel, who can also be seen on the field during pre-game warm ups. Sugarman, Secretary-General of the Israel Association of Baseball (IAB), moves quickly on the field with her camera in tow photographing players and meeting with members of the media and MLB personnel. The South African-born, 27 year resident of Israel has her own unique “woman in baseball” story. “I got involved when my son started playing baseball at age eight,” said Sugarman to the Post. Sugarman expected to be “just a baseball mom,” but she was soon recruited to be a coach. “Luckily, the coach coached me to be a coach. Next thing I knew, I was doing an umpire course!” Before she knew it, Sugarman was managing Israeli teams as they played in Italy and other European countries. She served as a board member for The Israel Association of Baseball and was recently elected the organization’s secretary- general. 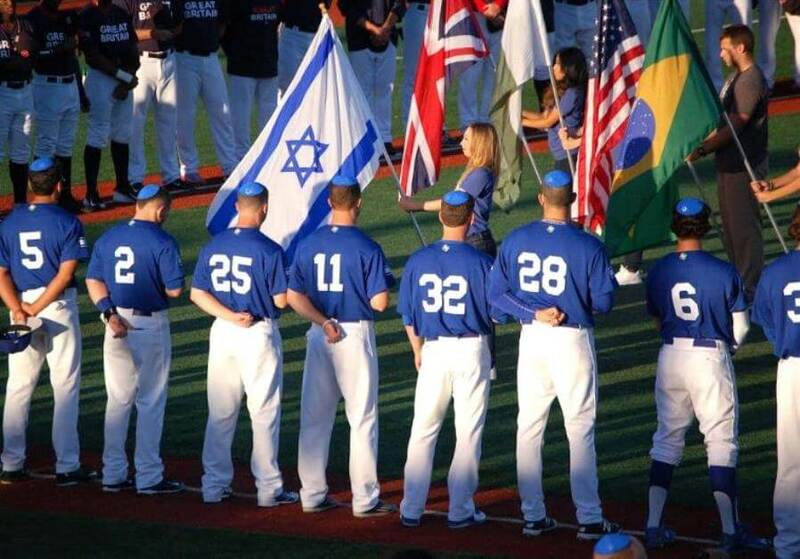 Sugarman is proud of Team Israel and of the growth of baseball in Israel. This week, Sugarman is focusing her attention on Team Israel. And, naturally, she feels a sense of pride. “They only came together last Saturday,” she said. “They are all happy they are playing for Israel, they talk like a team and relate to each other as a team. It is such an incredible atmosphere!” And, while Sugarman is excited about the team’s prospects to advance to the 2017 World Baseball Classic, she has more modest goals. 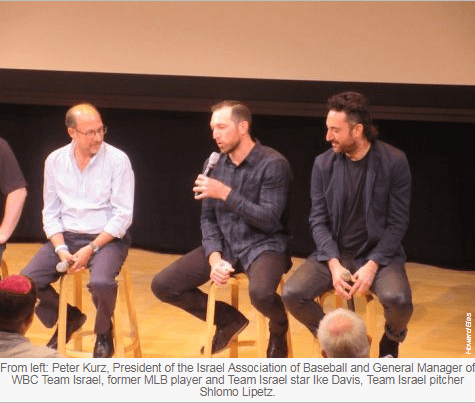 “I hope they will increase awareness of baseball in Israel – and have fun!” Peter Kurz, CEO of the Israel Association of Baseball, is proud of Siegal and Sugarman. BROOKLYN – The mood at MCU Park an hour before the first pitch of Sunday night’s World Baseball Classic Qualifier final was so relaxed one might not know it was the “do-or-die” game for Israel and Great Britain. As the evening went on, the significance of the outcome was clear to all: The loser was going home, while the winner would earn a trip to South Korea in March for Pool B of the 2017 World Baseball Classic. Peter Kurz, CEO of the Israel Association of Baseball, was smiling and schmoozing with Daniel Kurtzer in the stands as the former US Ambassador to Israel and current Princeton professor prepared to throw out the first pitch. Team Israel player RC Orlan, the 26-year-old left-handed pitcher for the Potomac Nationals was chatting with his father, Adam Orlan, and grandmother, who came up from Richmond, Virginia, to watch their son play. Autograph seekers of all ages lined up near the blue-and-white dugout for signatures – with former New York Mets first baseman Ike Davis the clear crowd favorite. Davis patiently signed well over fifty autographs. Both the young fans and their parents were quite appreciative and thankful. Some experienced older fans came with photos in plastic sleeves in three-ring binders. Who knows who the next star be? Howard Kaplan of Medford, Long Island, was in search of 21-year-old left-handed pitcher Alex Katz, currently of the minor league Winston-Salem Dash. No one was talking about the game yet. As the 6 p.m. start time approached, loyal fans began settling into their spots. Daniel Weiss of Brooklyn, who regularly sits in the first row on first base side for Brooklyn Cyclones home games, was celebrating his birthday at the ballgame. He and a friend were both wearing Cyclones jerseys written in Hebrew. Weiss readied his drumsticks and cowbell on a stand. Sixteen-year-old Rina Koegen, a student at the Prospect Yeshiva in Brooklyn, had so much fun at Thursday’s game that she brought her mother along today. “I don’t even know who I took pictures of!” remarked her mom, who planned to figure out who is who when she gets home. “My daughter was never a baseball fan, but she is so into it,” she continued. Weiss had some sense of the game’s importance. Adam Orlan also understands what tonight means for his son and for Team Israel. “You know what – I just might go too!” adds RC’s elderly grandmother. The small crowd of 2,016 crowd remained subdued through 41/2 scoreless innings. His words were prophetic as they were followed by a pair of two-run homers for Israel in the four-run bottom of the fifth inning. As the blue-and-white racked up one run in the sixth and seventh and three in the eighth, the fans began to grasp the momentous nature of the game. Manager Jerry Weinstein was very aware of the significance of the evening. He brought in Israeli-born Dean Kremer to pitch in the ninth. Kremer was the first Israeli drafted by a Major League Baseball team, when was chosen in 2015 by the San Diego Padres. In the 2016 MLB draft, Kremer was picked in the 14th round by the Los Angeles Dodgers, and the20-year-old played the 2016 season with the Great Lakes Loons, a Dodgers affiliate. The fans of sections 10 and 12 were on their feet. Kremer struck out the first batter, then gave up a single up the middle. Then another strike out. And amid chants of “od echad – one more,” Kremer struck out the side to end the contest. The crowd goes wild, waving flags, chanting and singing. Father and son Alex and Allen Golden were proud. Allen understands the significance of Israel winning the qualifiers. Liam Carrol, manager of Team Great Britain praised Israeli pitcher, Jason Marquis. The Israeli players struggled to put in to words what winning the tournament meant to them. “Today was real emotional for a lot of us. Today was special. Today was perfect,” observed third baseman, Decker, who unveiled a stuffed “Mensch on the Bench” doll he felt was partially responsible for the team’s exceptional performance. Weinstein hopes Israel’s win will heighten awareness of baseball in Israel and lead to even greater participation, more fields and coaches. He would welcome the opportunity to bring the team to Israel if funding is available. He hopes to bring most of his current team to South Korea, even if he has the option to recruit major leaguers who weren’t available to play in September (due to pennant races) but might be available in March. Did Team Israel think it could pull it off tonight and avenge the defeat in the 2012 qualifier final against Spain? Pitcher Shlomo Lipetz, a member of the 2012 team, thought they could. As he walked to the bullpen for the start of the game, we reminisced on having met four years ago at City Winery in New York City, site of his day job. He was right. Israel is off to South Korea!